The blog at Forbidden Planet International is reporting that artist John Hicklenton has passed away. The news originated with the 2000 AD forums and has since been confirmed. Hicklenton was afflicted with Multiple Sclerosis, and his struggle against MS had become well-known in the UK creative community and more widely through the documentary Here's Johnny. Hicklenton collaborated with writer Pat Mills after initially contacting the writer directly, looking for work. He worked with Mills on runs of the Nemesis the Warlock and Third World War series in the late '80s and early '90s. 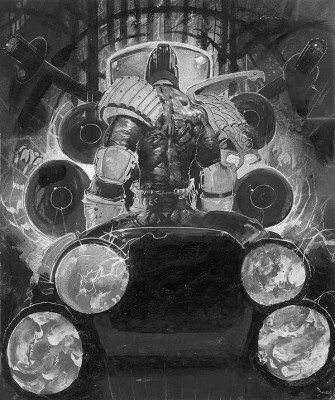 Work on the Judge Dredd character in Judge Dredd Megazine followed in addition to a number of short works throughout. 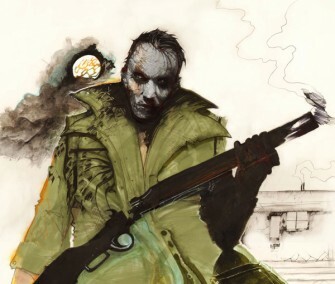 In the late 1990s he provided the art for a four-issue, Pat Mills-written Dark Horse series called ZombieWorld: Tree of Death, working as John Deadstock. 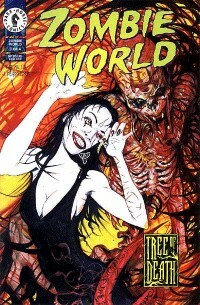 That series was later collected as part of 2005's ZombieWorld: Winter's Dregs. Hicklenton employed an art style slightly off-center from established commercial norms, but one that offered compensations in terms of meticulous rendering and a sense of visceral character design that would have served the artist well in a number of genres. Grant Goggans, a critic with a special interest in the British comics industry where Hicklenton made his career, told CR that the artist impressed him on taking over from Bryan Talbot on Nemesis in the 1980s and didn't stop. "Hicklenton specialized in wild-eyed madmen with clenched teeth and heads set at awkward angles, and stories set in the ruins of urban decay. His Mega-City One was not a place of futuristic wonder, but crumbling basements and black, black sewers. His work could be very challenging and deliberately confrontational, and not just in the way he could obscure traditional panel transitions and storytelling by forcing background elements and shadow into play, but in the way his monsters, demons and aliens didn't look like comic book creatures. They looked like genuine nightmares." In 2000, Hicklenton received a diagnosis of MS following years of aches, pains and weaknesses for which doctor could find no direct cause. In an interview with the Telegraph given in 2008, he described how he learned he had the disease in almost blunt, comical terms. The occasion of the interview was his participation in the documentary Here's Johnny, which won two Grierson Awards that year. According to this review, the documentary tracks the artist's growing debilitation and his anger towards the remove at which he and other sufferers are treated by the medical establishment. Hicklenton continued to draw, and had at least one major credit in the late 2000s, a story called "Blood of Satanus III: The Tenth Circle," again with Pat Mills for Judge Dredd Megazine. This was in 2007. He was also working on a project called Sand for a group called Renegade arts entertainment. An interview in 2000 AD Review revealed a thoughtful artist enthusiastic about the comics medium, happy to be (as he described it) "a grafter working in the basement," and a fan of runs of work on the various 2000 AD characters that might have fallen slightly out of favor. He described as his own strengths his painting. Mentioning that he was slightly put off by descriptions of his comics as violent, he admitted he found compelling that element of his work. ... I think violence is fascinating. I've seen someone beaten half to death, and I was very disturbed by it. I can't watch operations and if I have an injection I have to look away. If it's real, then I can empathize with the suffering there. But I sometimes get frustrated with the reactions when I do violent stuff. There's some good gory stuff in Satanus, but it's just fantasy. No one's suffering except me... and Claire (John's wife). It's not real, but I think that every human being, if we're honest, is fascinated with the power, viscera and beauty of violence because of its purity. In an initial statement, longtime collaborator Pat Mills called Hicklenton "A great artist and a true hero."